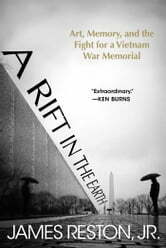 A Rift in the Earth tells the remarkable story of the ferocious “art war” that raged between 1979 and 1984 over what kind of memorial should be built to honor the men and women who died in the Vietnam War. The story intertwines art, politics, historical memory, patriotism, racism, and a fascinating set of characters, from those who fought in the conflict and those who resisted it to politicians at the highest level. At its center are two enduring figures: Maya Lin, a young, Asian-American architecture student at Yale whose abstract design won the international competition but triggered a fierce backlash among powerful figures; and Frederick Hart, an innovative sculptor of humble origins on the cusp of stardom. More By James Reston Jr.